We have an experienced team of SAP certified consultants with wide range of SAP module skill sets. This includes SAP core modules as well as industry specific modules like IS-Utilities. We provide consulting, design and integration services to help our clients focus more their business with smooth IT infrastructure performance models. We provide architecture, design, implementation planning, rapid integration, project management, product planning and financial modeling for your network infrastructure. Does your organization already have SAP? If you already have SAP implemented in your organization and are looking for quality SAP support services, our skilled and experienced SAP certified consultants can assist you. Are you evaluating SAP implementation in your organization? We can get involved at early stages to perform the consultancy and draw detailed blueprints followed by the implementation and support. 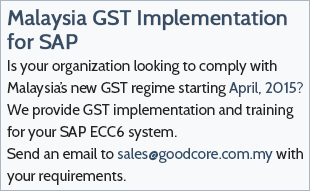 Contact us today to discuss your SAP related requirements in Malaysia. We will be happy to assist you.